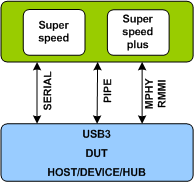 USB 3.0/3.1/3.2 Verification IP provides a smart way to verify the USB 3.0/3.1/3.2 component of a SOC or a ASIC. It provides backward compatibility support for earlier versions 3.0,3.1 and 3.2 of USB specifications. The SmartDV's USB 3.0/3.1/3.2 Verification IP is fully compliant with standard USB Specification 3.0/3.1/3.2. The USB 3.0/3.1/3.2 VIP can be readily customized and optimized for a wide range of specific system applications. Faster testbench development and more complete verification of USB 3.0/3.1/3.2 designs. SmartDV's USB 3.0/3.1/3.2 Verification env contains following. Complete regression suite containing all the USB 3.0/3.1/3.2 testcases.